I will not gush on, over, around or near Mad Men, but we likes our precious. It doesn't have the bite of True Blood (groan), the sharp edge of Dexter (oh jesus stop), or the comedic meat of Hung (ok killing myself now), but it's got the monopoly on flavour. 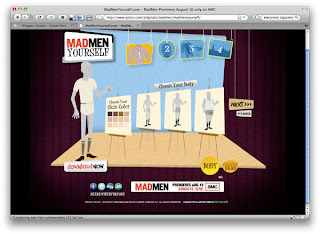 Seeing as how the 3rd season just started, there's a few things going on at the AMC website for Mad Men. 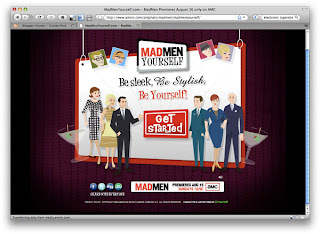 The first is the option to "Mad Men" yourself. This is a bit familiar. Build a Character. 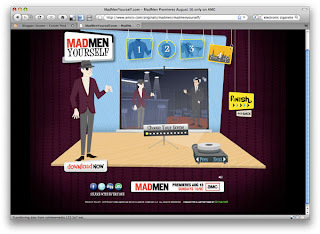 Choose the scene and then download the wallpaper or avatar. I'm the one on the right. Not sure who the jackass with the eye-patch is. I'm a bit disappointed with this piece. 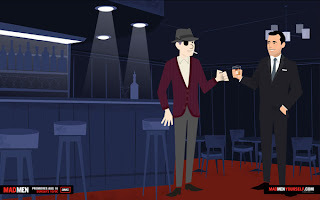 Not only is it a common mechanic, it just doesn't seem to fit Mad Men. Smells corporate to me. The other thing going on, you might be interested in....grab yer camera, Annie. 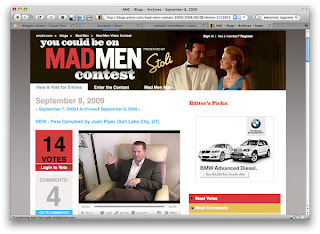 Film yourself doing a part from Mad Men and win a walk-on appearance. Or just vote on the ones that have submitted. I counted 60+ entries, all available to watch.